Team Smith: Yeah, she's a weirdo! "What, momma? I need to get clean, don't I? 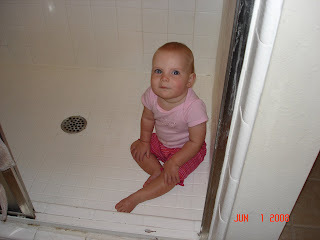 No, I don't think it's weird that I beeline for the shower every time I'm on the floor..."
It's cute and funny! I like this shot because I can see her face well. What a doll.